Eni Fa'aua'a Hunkin Faleomavaega Jr.
Faleomavaega and former president of the Marshall Islands Kessai Note. 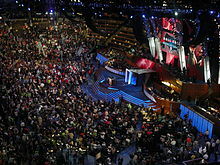 Faleomavaega, a superdelegate, announces the distribution of American Samoa's delegate votes as part of the roll call of the states during the third day of the 2008 Democratic National Convention in Denver, Colorado. 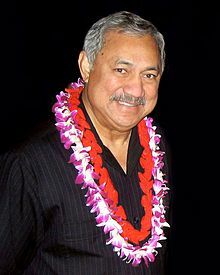 Faleomavaega was elected as a Democrat to the House of Representatives in 1988, serving from January 3, 1989 until January 2015. As a delegate, he has worked to receive more federal funding for his home territory, particularly for health care and other essential services. He has opposed free trade deals involving meats and seafood, as nearly one-third of his territory's population is involved in the tuna industry. He proposed legislation that would allow residents of US territories to vote in presidential elections if they are active duty members of the military. 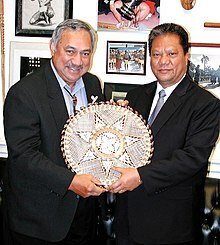 Faleomavaega also participated in a boycott of Jacques Chirac, who made a speech to a joint session of the U.S. Congress in 1996, due to French nuclear testing in the Pacific. ^ "Eni Faleomavaega, who served 13 terms as delegate from American Samoa, dies at 73". Washington Post. ^ "Rep. Eni Faleomavaega | 17 Mormons in Congress in 2013". Deseret News. 2012-11-13. Retrieved 2016-04-01. ^ a b Fili Sagapolutele (November 9, 2014). "1st Woman Elected as American Samoa Delegate". Associated Press. Retrieved March 20, 2015. ^ a b Cama, Timothy (November 5, 2014) - "American Samoa Delegate Loses Seat". The Hill. Retrieved March 20, 2015. ^ "Eni Faleomavaega, 73, American Samoa's Long-Serving Delegate to Congress, Dies". ^ a b "Biography of Eni Faleomavaega". U.S. Congress. Archived from the original on 2008-05-05. Retrieved 2008-05-09. ^ "Eni Faleomavaega, United States Congress". House.gov. 1943-08-15. Archived from the original on 2010-08-10. Retrieved 2010-07-12. ^ "Double Standards in US Foreign Policy Questioned". YouTube. Retrieved 2016-04-01. ^ "American Samoa must consider independence - congressman | Pacific Beat | ABC Radio Australia". Radioaustralia.net.au. 2012-05-18. Retrieved 2016-04-01. ^ "Call for independence discussion for American Samoa | ABC Radio Australia". Radioaustralia.net.au. 2012-05-18. Retrieved 2016-04-01. ^ Elliot, Justin (April 2, 2012). "Meet Bahrain's Best Friend in Congress". ProPublica. ^ Elliot, Justin (April 11, 2012). "Law Shrouds Details of Congressional Trips Abroad". ProPublica. ^ "H.R. 1362 Text - 115th Congress (2017-2018)". US Congress. April 5, 2017. ^ "Territory's VA clinic now officially named after Faleomavaega Eni Fa'aua'a Hunkin | Samoa News". samoanews.com. Retrieved 2017-04-05.